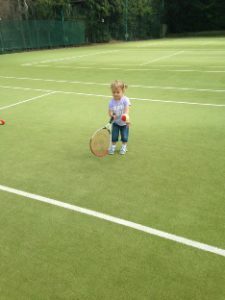 Looking for your 3 and 4 year olds to get into sport? This new idea is getting increasingly more popular around the country, so come join us! Also, this fun session helps your child to develop great social skills, interacting and playing with other children their age. 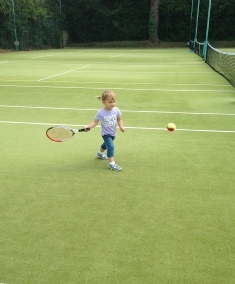 During the Easter and summer holidays we will be running a Tots Tennis Easter Camp. The Easter camp will run from Monday 8th April- Friday 12th April and will be every day from 9am-9:30am. Please click this link to take you to the holiday camps page with more information and a booking form. Bookings for new tots will be accepted one month prior to the course commencing. This is to allow existing tots to re-book. If the course you wish to join is full then you will be placed on a waiting list. You may place your child’s name on a waiting list at any time and will be contacted as soon as a space becomes available. Weekday tots sessions are limited to 6 places so the hall can be used in the event of rain, and to offer a low coach to tot ratio. Saturday sessions will be limited to 10 places and will be run by 2 coaches.